The NFU along with eight young NFU members joined the Worshipful Company of Farmers and other stakeholders; Massey Ferguson, Red Tractor and Surrey Docks Farm to participate in the 803rd Lord Mayor’s Show on Saturday 10 November 2018. This is the 5th year that the NFU has supported the Worshipful Company of Farmers in this annual event. Wth an estimated 600,000 people lining the streets of London it’s a prime opportunity to engage with the general public and tell them that British farmers are proud to produce their food. During the parade, Katie Anderson representing the NFU south east region was interviewed by Chris Hollins and explained to the BBC TV audience of 4 million people why she is proud to help produce the nation’s food. This year Massey Ferguson provided machinery for the event consisting of a Massey IDEAL 9T combine, one of the most advanced combines on the market, and a brand new Massey 6714S tractor. The tractor bucket was brimming with hampers of British produce to help the public connect food with farming, as well as promote fantastic British fare. Had the most incredible couple of days in London representing the West Midlands in the Lord Mayor’s Show! Great opportunity to show the public how important it is to support British farmers. Thank you to everyone that made it possible! Great day spent showcasing our fantastic industry. Hitting the streets of London to parade and meet the general public was a highlight. One person even thanked me for producing food and for his breakfast. Extremely proud to be a farmer! This has been a great opportunity to show everyone what Britain has to offer! 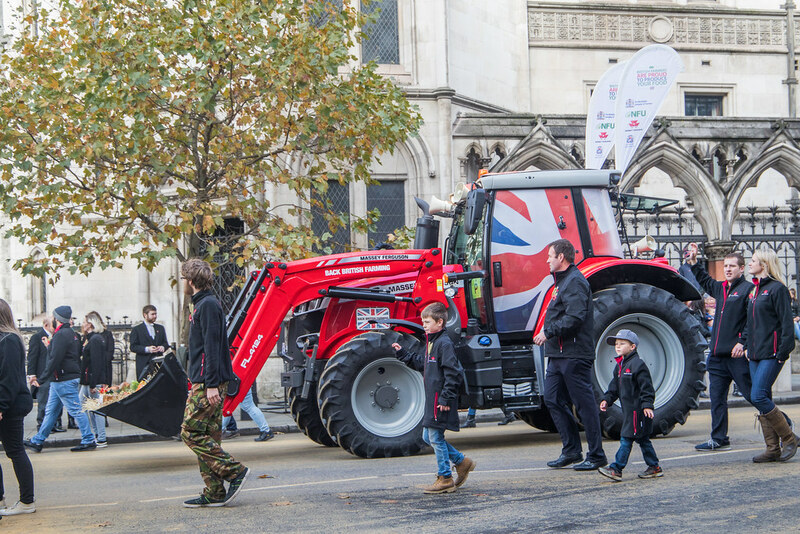 A huge thank you to Worshipful Company of Farmers, NFU, Red Tractor ad Massey Ferguson for the opportunity to #Back British Farming this weekend at the Lord Mayor’s Show. A great group of new friends who share the same ambitions – to promote our amazing industry! A special hamper was also presented to the new Lord Mayor which included oils, preserves and drinks made from the best British produce plus a copy of the Countryside Kitchen cook book.